In three days, July 4th, the spacecraft Juno will arrive at Jupiter, the culmination of a five-year, billion-dollar journey. It’s mission: to peer deep inside the gas giant and unravel its origin and evolution. One of the biggest mysteries surrounding Jupiter is how it generates its powerful magnetic field, the strongest in the solar system. One theory is that about halfway to Jupiter’s core, the pressures and temperatures become so intense that the hydrogen that makes up 90 percent of the planet — molecular gas on Earth — looses hold of its electrons and begins behaving like a liquid metal. Oceans of liquid metallic hydrogen surrounding Jupiter’s core would explain its powerful magnetic field. But how and when does this transition from gas to liquid metal occur? How does it behave? 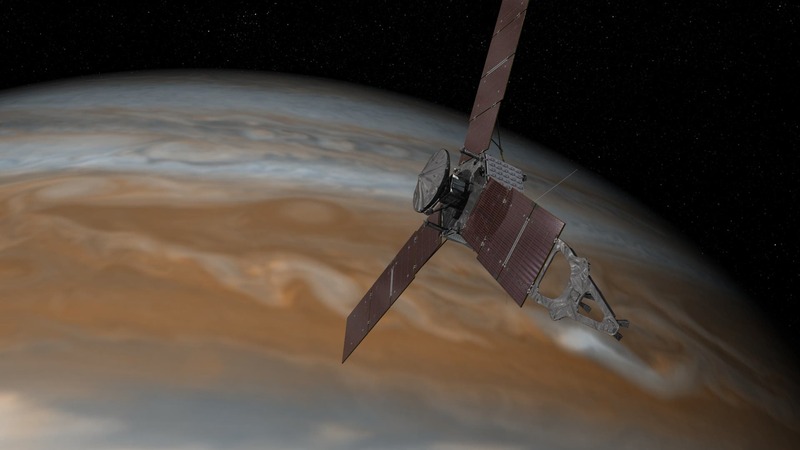 Researchers hope that Juno will shed some light on this exotic state of hydrogen — but one doesn’t need to travel all the way to Jupiter to study it. Four hundred million miles away, in a small, windowless room in the basement of Lyman Laboratory on Oxford Street in Cambridge, Massachusetts, there was, for a fraction of a fraction of a second, a small piece of Jupiter. Earlier this year, in an experiment about five-feet long, Harvard University researchers say they observed evidence of the abrupt transition of hydrogen from liquid insulator to liquid metal. It is one of the first times such a transition has ever been observed in any experiment. In the experiment, Zaghoo, Ashkan Salamat, and senior author Isaac Silvera, the Thomas D. Cabot Professor of the Natural Sciences, recreated the extreme pressures and temperatures of Jupiter by squeezing a sample of hydrogen between two diamond tips, about 100 microns wide, and firing short bursts of lasers of increasing intensity to raise the temperature. This experimental setup is significantly smaller and cheaper than other current techniques to generate metallic hydrogen, most of which rely on huge guns or lasers that generate shock waves to heat and pressurize hydrogen. The transition of the liquid to metallic hydrogen happens too quickly for human eyes to observe and the sample lasts only a fraction of a second before it deteriorates. So, instead of watching the sample itself for evidence of the transition, the team watched lasers pointed at the sample. When the phase transition occurred, the lasers abruptly reflected. The results represent a culmination of decades of research by the Silvera group. The data collected could begin to answer some of the fundamental questions about the origins of solar systems. In the Gemini Observatory image at the top of the page, white indicates cloud features at relatively high altitudes; blue indicates lower cloud structures; and red represents still deeper cloud features. The two red spots appear more white than red, because their tops hover high above the surrounding clouds. Also prominent is the polar stratospheric haze, which makes Jupiter bright near the pole. Other tiny white spots are regions of high clouds, like towering thunderheads. In visible light Jupiter looks orangish, but in the near-infrared the blue color is due to strong absorption features. The blue mid-level clouds are also closest to what one would see in a visual light image.